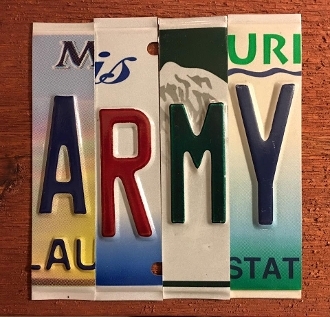 Army License Plate signs. Our license plate signs are made from recycled license plates that have been retired. Each plate is Unique and no two are ever the same. We never use numbers for letters and we don't use roadkill or rusty plates. The letters are mounted onto stained rough cut cedar with a sawtooth hanger on the back.